Two commuter trains collided head-on in Philadelphia on Tuesday, injuring four people. The crash happened near the 69th Street Terminal during the city’s busy morning commute. "There are [probably] about a half a dozen cars that are involved as a result of the crash," Upper Darby Police Department Superintendent Michael Chitwood told CBS. The trains were empty when they collided, but minor injuries occurred when one of the cars toppled onto a separate parked car that housed a homeless man. All the other injured parties are reported to be workers from the Southeastern Pennsylvania Transportation Authority (SEPTA). A total of four people have been hospitalized, but their injuries are not serious. Neither train was traveling at high speed at the time of the crash, which occurred in a rail yard. Upper Darby police asked people to avoid the train terminal. Unfortunately at work. 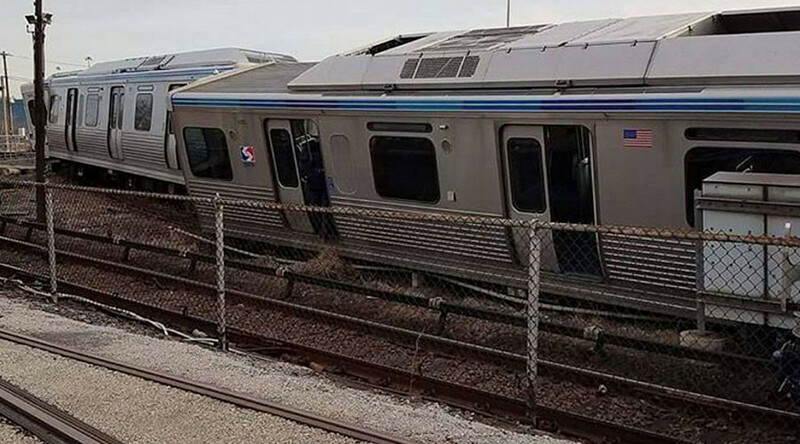 Stay away from the Market Frankford Line today..prayers for all those injured..
Septa Terminal-reports of 2 trains colliding. Please avoid Septa 69th Terminal. SEPTA said investigators are combing the scene before the trains involved can be removed.